KIS FUTURES is a Commodity, Futures and Options Brokerage. KIS FUTURES specializes in Futures and Options for Institutions, Commercials, Hedgers, and Individual Traders and executes trades for its clients in the following markets: Livestock, Grains, Energy, Metals, Softs, Financials, Currencies, and Stock Index Futures. For more information, please call us Toll Free at (800) 256-2555. LANE BROADBENT • President / Principal • KIS FUTURES. Lane is the President of KIS Futures and has been with the firm for over 23 years. He has worked as a commodity futures broker since 1988 primarily servicing livestock, grain and energy hedgers and traders. Lane is a graduate of Southwestern Oklahoma State University where he received his degree in Finance. Lane grew up on a cattle ranch in western Oklahoma and still runs cattle to this day. Lane is registered with the National Futures Association and holds a Series 3 License. JUSTIN LEWIS, M.B.A. • Vice President • KIS FUTURES. Justin is Vice President of KIS Futures where he has been a broker since 2004. He received a Finance degree from the University of Oklahoma and a Masters of Business Administration from Oklahoma Christian University. Justin services individual customers and institutional clients in all Futures and Options markets. Justin is a Graduate Professor in Finance and Economics for Webster University's George Herbert Walker's School of Business and Technology. The majority of his students are service members in the U.S. Army. Justin is a "Part-Time CFO" consultant and advises executives on financial decisions throughout their enterprise. He has presented numerous risk management presentations to various groups such as Oklahoma Banker's Association, U.S. Wheat Council, and many other groups. STEVEN GRANTHAM • Vice President • KIS FUTURES. Steven began working at KIS Futures part-time during his high school and college years. In 2000 he received his B.S. degree in Business Administration from Oral Roberts University in Tulsa, Oklahoma. That same year, Steven received his Series 3 Registration with KIS Futures. He worked in the KIS Futures Stockyards Branch Office specializing in Live Cattle and Feeder Cattle Hedging as well as executing Energy Futures and Options for large traders. After spending the last 8 years as an artist, singer/songwriter at a large Oklahoma City church, Steven returned to KIS Futures in 2009 working in office operations and executing trades. Currently, Steven holds his Series 3 License and executes futures and options trades on all major exchanges for KIS customers. HARLAN COIT • Commodity Futures Broker • KIS FUTURES. 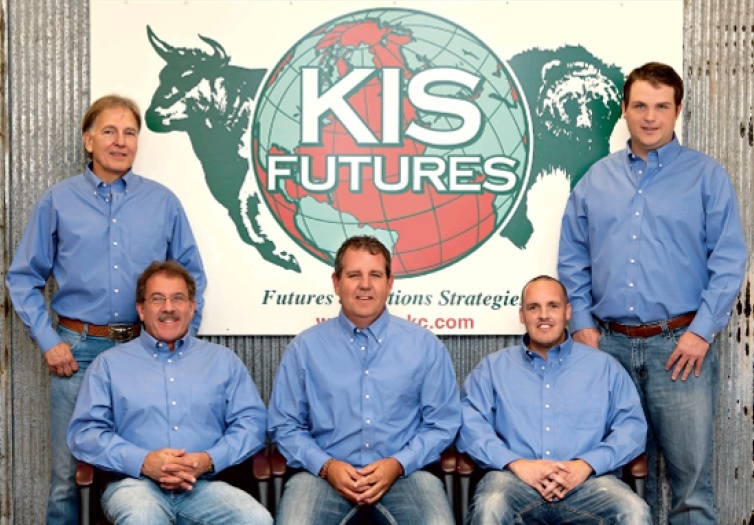 Harlan has been a commodity futures broker since 1991 and has been with KIS Futures since 1994. He also has over 25 years of experience in Cash Marketing. Harlan is President and a Principal of OKC West Livestock Market in El Reno, Oklahoma . He received his Finance Degree from Oklahoma State University in 1965. Harlan assists his clients in the Livestock, Grain, Energy, Currency, and Equity Markets (both Futures & Options). Harlan is registered with the National Futures Association and holds a Series 3 License. TOM PUCKETT • Commodity Futures Broker • KIS FUTURES. Tom has been a commodity futures broker with KIS Futures since 1999. He graduated from the University of Central Oklahoma in 1970. Tom began trading futures in 1980 and provides technical analysis in the Agricultural Markets, Energies, and Metals markets. Tom is registered with the National Futures Association and holds a Series 3 License. DISCLAIMER: Trading commodity futures and options involves substantial risk of loss and may not be suitable for all investors. You should carefully consider whether trading is suitable for you in light of your circumstances, knowledge, and financial resources. Opinions, market data, and recommendations are subject to change at any time. This brief statement does not disclose all of the risks associated with trading commodity, futures, and options. The information contained on this Web site does not constitute a solicitation to buy or sell by KIS Futures. This Web site is not to be available to individuals in a jurisdiction where such availability would be contrary to local regulation or law. KIS FUTURES is a Commodity Futures and Options Brokerage located in Oklahoma City, Oklahoma . KIS FUTURES specializes in Futures and Options for Institutions, Commercials, Hedgers, and Individual Traders and executes trades for its clients in the following markets: Energy, Livestock, Grains, Metals, Softs, Financials, Currencies, and Stock Index Futures. For more information, please call us Toll Free at (800) 256-2555.